June 2007 – My Story – ISB and beyond !!! It was an enjoyable concert that lit up my Saturday evening. All kritis were rendered well. Kalpana swarams were put at the pallavi line in “nEnendu” and “shrInivAsa nInE” and at “bhujagAdhipa shayana …” in “nijadAsa varadA“. Neraval was done for the same line in “nijadAsa varadA” and at “nArAyaNa tAraka divyanAma” for “shrI rAjagOpAla“. Vid Gayathri’s raga alapanas were very melodious and captivating. Her Anandabhairavi alapana was hailed as “brahmAnandabhairavi” by one of the rasikas. Vid Gayathri was ably assisted by all her accompanists. Vid Charumathi’s raga alapanas were enjoyable. Vid Erode Nagaraj and Vid H. Prasanna played well for all the songs. Vid Nagaraj’s ghumukki laden accompaniment gelled very nicely with the songs. 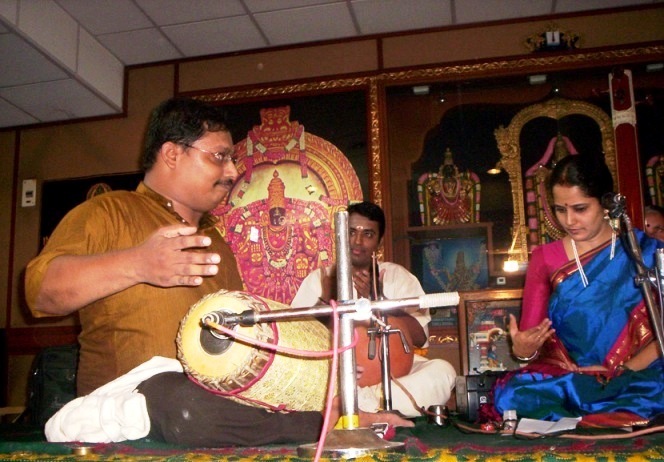 Taniavartanam played for the kriti “nijadAsa varadA” comprised the catusra and tisra naDais. The concert ended with a tillAnA on Lord Anjaneya in raga vasantA and a traditional mangaLam. Reminds me of the same time last year when I attended most concerts in that series, traveling all the way from the opposite end of the city. It was one of those days when the whole of Chennai seemed to have landed at Narada Gana Sabha (NGS). All life on TTK Road just outside the sabha had almost come to a standstill. As I looked at the strong crowd that thronged the doors of the Satguru Gnanananda Hall (Main Hall), I wondered whether NGS had been chosen as a venue for the free TV distribution drive. Then I remembered reading in the morning papers that the Jaya TV Ragamalika show was celebrating its 200th episode in the Main Hall. I am amazed at Jaya TV’s and Maximum Media’s ability to to pull such huge crowds to whatever shows they conduct together (Margazhi Maha Utsavam, Jaya TV Pancharatna Kritis, Ragamalika etc). Apparently even Narada Gana Sabha’s secretary Sri Krishnaswamy, who was supposed to give a short speech before Vid Gurucharan’s concert at 6.30 PM, was not able to enter the premises (with his vehicle) from 6.05 PM till about 6.40PM (this was disclosed by Papanasam Sri Ashok Ramani later). Vid Gurucharan’s concert was at the much smaller Mini Hall which was almost full when I walked in. Vid Gurucharan had by then started the concert and was singing his first number for the day “tuNai purindaruL“. Kalpana swarams were put at the pallavi line. Vid Nagai Sriram had already gotten into the act and whatever he played on the violin was so melodic and so very impressive. Kalpana swarams were put at “alarmEl mangai maNALA” in “venkaTaramaNA“, at “parivAi ranganAyaki …” in “tiruvazhundUr vAzh mAdhavA” and at “surEsha rAmadAsanuta” in “shrInivAsa tava charaNau“. Neraval was also done for the same line in the danyAsi kriti. Viruttam sung for song 7 was from the caraNam of Sri Sivan’s kalyANi composition “oru varam tandaruL“. Viruttam for song 8 was from the pallavi of the vasantA composition “aDimaiyin uLLa kuDisaiyil”. Taniavartanam was played in rUpaka tALam by Vid Tiruvarur Vaidyanathan and comprised the catusra and tisra naDais. The choice of songs seemed very good. I came to know from one of my acquaintances that the theme of the concert was compositions of Sri Papansam Sivan on Lord Vishnu, Lord Rama and Goddess Lakshmi. Papanasam Sri Ashok Ramani announced just before the mangaLam that they had been holding such thematic concerts based on Sri Sivan’s compositions for quite some time now. He remarked that there were so many themes to draw upon from Sri Sivan’s works that even after conducting about 18 such different concerts, there were still an ample number left to be taken up in the future. Veteran Vid T. Rukmini and her disciple Vid Amritha Murali presented a melodic treat to rasikas assembled at the Samajam. Their violins simply sang. Listening to them play was like listening to someone singing the songs, doing full justice to them all the while. The concert started with the vasantA varnam “ninnE kOri“. The entire varNam was played in two speeds to some brilliant accompaniment by Vid Pathri Satish Kumar and Vid S. Karthick. Kalpana swarams were put in “gam gaNapatE” at the pallavi line, in “nidhicAla sukhamA” at “surapati tyAgarAja nutuni … ” and in “kaddanuvAriki” at “niddura nirAkarinci …. “. Neraval was also done for the same line in “kaddanuvAriki“. Though all the songs were played beautifully taking an unhurried approach, I especially liked the “entamuddO” and “bArO krishnayyA” renditions. The mAND in “bArO krishnayyA” just seemed to flow so freely, captivating me totally. Vid Satish Kumar, one of my favorites when it comes to accompaniment for songs, was brilliant as usual. He almost played the songs on the mrudangam. His anticipation skills were extraordinary. Calculations seemed to be constantly running in his mind as he chose at will, endings that fit well aesthetically for different places in the songs. His experience and intelligence just shone through in the way he superbly, yet effortlessly played for the songs. Combine Vid Satish Kumar with ghatam vidwan S. Karthick and you get a adorable percussion team that just does wonders. Vid Karthick was again very impressive. The camaraderie was there to be seen. Both the percussionists kept appreciating each other from time to time. The taniavartanam they played was very enjoyable. Vid Satish Kumar ended it in his usual style by playing a kOrvai that fit well with the start of the portion of the song at which the taniavartanam had been given. A thoroughly enjoyable concert indeed. How would a Carnatic musician feel if fans in Chennai – the “Mecca of Carnatic Music” eagerly await his/her performance almost every time it is scheduled to happen? What a feeling it would be if for him/her to see people of all ages assembled in large numbers, right from tiny tots to veteran rasikas to veteran artists themselves, just to hear him/her sing !!!! It is a privilege only very few chaste classical musicians enjoy and one among them is Vid Sanjay Subrahmanyan. I don’t even remember when I last saw such a huge turnout at the Samajam. Rasikas came in large numbers in anticipation of a great concert and Vid Sanjay delivered, the way he does almost every single time he performs. Vid Sanjay started what turned out to be an exclusive Tyagaraja kritis concert with a outline of the darbAr raga and was just about to finish it when the organizers at the Samajam, an institution run by musicians, suddenly remembered they had to announce the name of the artists of the evening and a few other minute details that they deemed very important. Once all these formalities got over, Vid Sanjay launched into a fast paced “yOcanA” to some explosive but good accompaniment by Vid Guruvayur Dorai with Vid Neyveli Venkatesh following Sri Dorai like his shadow. KalpanA swarams were put at the pallavi line. A very good rendition of “rAmA ninnu namminA” followed suit. A detailed raga alapana of varALi came next. The close to 4.5 minute alapana by Vid Sanjay was a treat to the ears, as was the one Vid Nagai Muralidharan played later. 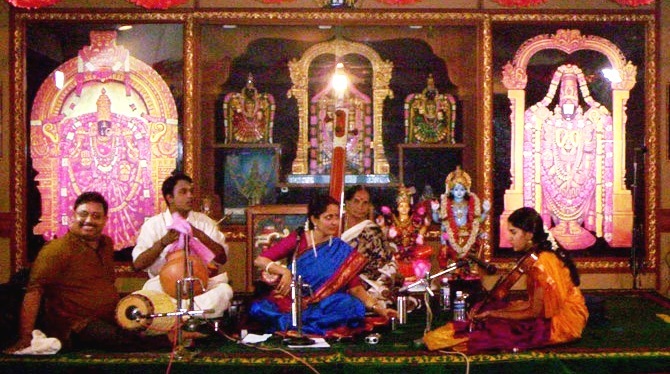 “nE pogaDakunTE” was sung with neraval and kalpana swarams at “nIraja nayana shrI tyAgarAjanuta ….” in the caraNam. There were some simple but intelligent patterns used at the beginning of the kalpana swaram itself like G M P ; M P D ; P D nIraja , G M P ; P ; M P D; D; P D N ; nIraja and G M P ; P ; P ; M P D; D; D; P D N; N; nIraja. Taniavartanam was played for Adi tALam primarily in the catusra and tisra gati. During the first round of catusra gati, Vid Guruvayur Dorai also played a small portion in kanDa gati. The same was also played by Vid Neyveli Venkatesh when his turn came. Vid Sanjay wrapped up this wonderful concert with “rAmacandra nI daya” in suruTTi followed by the traditional mangaLam in saurAshTram. The Gods too seemed to be delighted to hear the concert and they seemed to be expressing their happiness in the form of rains that lashed the city after the concert got over. “Moorthi siridhaanalum keerthi peridhu (form might be small but fame is large)“. This is how the organizer introduced Vid Saketaraman. It is indeed surprising at times as to how a person with such a frail frame can produce such a strong voice !! Vid Saketaraman started the concert with Sri Tanjavur Sankara Iyer’s beautiful varNam in hindOLam “mAl marugan“. Sri Papanasam Sivan’s “karuNanidhiyE” was then rendered nicely with kalpanA swarams at the pallavi line. Vid Charumathi Raghuraman accompanied very well for this song playing in the lower octave for some of the lines and this I thought gelled very well with the vocal. The start of a bhairavi rAgA outline saw many people letting out loud gasps. “bhairavi for the third song itself?” seemed to be the question in everyone’s minds. But many looked satisfied when Vid Saketaraman chose “cintaya mA” and were found busily scanning the pages of their raga/kriti guides, searching for the song. After bhairavi came the hamsanAdam alapana. hamsanAdam is a raga I like a lot (the modern version; not many sing the older version) and needless to say I thoroughly enjoyed the alapana by both the vocalist and the violinist. Every time someone starts singing a hamsanAdam alapana, my mind starts speculating “kalyANa rAmA“, though what ensues quite often is “baNTurIti“. This time however, I was rewarded when my favorite song in this raga “kalyANa rAmA” was actually taken up. It was a very neat and impressive rendition with neraval done for “rAghava raghurAma rAmA” and kalpanA swarams put alternatively at “rAghava” and “janakajA ramaNa“. The main song was “Emi jEsitE” in tODi. Neraval was done for the anupallavi line “kAma mOha dAsulai .. ” and kalpana swarams were put at “shrI rAmuni“. A good taniAvartanam was played with an eDuppu of 0.5 beat before samam (for “shrI rAmuni“) by Vid Trivandrum Balaji. Sri Lalgudi Jayaraman’s tillAnA in vAsanti and the traditional mangaLam brought the curtains down and saw Sri Saketaraman scurry off to catch the train back to Bangalore. His sister Vid Vishaka Hari was present listening to the entire concert. Such is the adulation audiences shower on her that most mamis present there flocked towards her after the concert got over making it a bit difficult for lesser mortals like me to find their way out. I left thanking heavens that her presence had not been announced in the morning papers beforehand. R.K. Swamy Auditorium is one of the few auditoriums in the city where the sound amplification is often simply superb. I am sure this must be playing a pivotal role in the success of the concerts that are held there. Vid Sikkil Gurucharan’s concert too had a good mic setting though the amplification level was a bit higher than usual. The concert started with the kalyANi varnam “vanajAkshi” which I am hearing after a long time now. A short sketch of kApinArAyaNi followed. 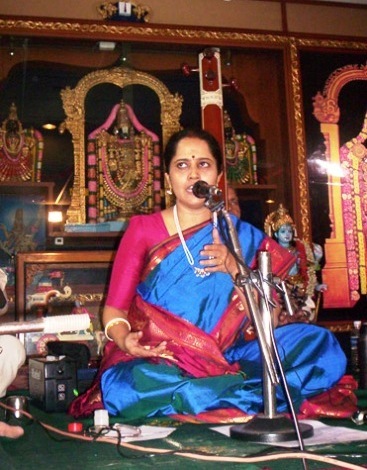 Kalpana swarams in “sarasa sAma dAna” were sung at “hitavu mATalentO …..” . “mAyammA yani nE” was started with the anupallavi “nyAyamA shrI …” and was sung very well in a slow, moving way. The ragas taken for elaboration were bEgaDA and kIravANi and were dealt with very nicely by both Vid Gurucharan and Vid Nagai Sriram. Neraval and kalpana swarams were put in “anudinamunu” at “kanakanaruci nirupamu“. 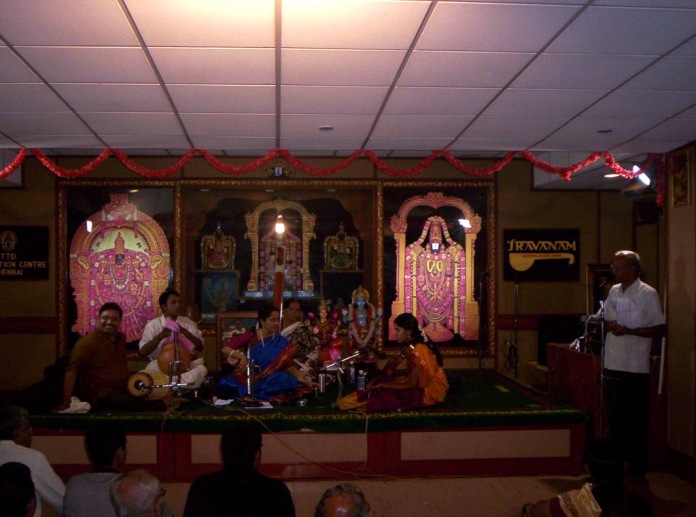 Kalpana swarams were put at the pallavi line itself for “bhAvayE sArasanAbham“, a kriti not sung that often in the concert circuit. Vid Trivandrum Balaji and Vid E.M. Subramaniam accompanied well for the songs.